The word Chi or Qi is widely used in all chinese texts that deal with medicine, feng shui, esotericism and various arts.This word denotes life energy that nourishes and sustains all that surrounds us. There are equivalent words in other languages like Pnuema in greek, Ki in Japanese, Prana in sánskrit, etc, all of them appoint to a subjective breath that sustains the universe. For a feng shui master Chi refers to the existence of an invisible fluid that nourishes the space giving him life and certain characteristics. The task for the master then will be to determinate the quality, organization and distribuition of this energy in a particular space weighing up its effects and finding out if they are positive or negative depending upon the functions.Chi than is observed in its multiples terrestrial forms, naturals and artificials, the cycles of time and the influences that mark the directions. In lots of taoist treaties the evolution of the universe is described from the energetic point of view, representing the void or Wu Chi as an empty circle, continuing to conception (fertilized egg), to the diversification that represents Yin and Yang symbolized in the image of Tai Chi. Classical Feng shui uses the term Sheng Qi to express the positive and beneficial part of this energy (places with good feng shui) and the word Sha Qi for the opposite, in other words, rather unfavorable environments. The direct way of knowing whether the Chi around you is favorable or not, is to use your own sensibility and common sense. A place with good feng shui helps people to feel good and to experience harmony in their lives. A place with bad feng shui facilitates disease, lack of understanding and general chaos to name some adjectives. Think of a river with clean water and calm movement, this generates (Shen Qi), now think of a polluted stream, stagnant and turbulent (Sha Qi). Like the rivers, the invisible qi extends along the directions, forms and cycles of time. In a more subtle level, the kind of Chi that is good for someone, might not be that good for you. That way certain places, orientations, concrete forms, colors, etc., can help one person and at the same time hinder the expression of another.Although there are general rules for the space and the human being, they may differ according to the idiosyncrasy. It is like the exposure of the sun, some may get burned in 20 minutes, and others can stay for hours without harm, which is not invalidating that the sun in excess can be counterproductive. Throughout this website you will see the word Qi or Chi in different occasions. Try to understand it like a form of capturing the atention to the fluid that pervades all things providing them of different qualities, both positive and negative ones. We have considered the words Sheng Qi and Sha Qi in general. Let us see other "dual" qualities that are given to Chi according to its contrasts. YANG ENERGY denotes activity, movement, light, and therefore is related to all that suggests these aspects such as the sun, the dayt, the color red, a strong voice, stress, wakefulness, life, fire, the noise, the summer, masculine and so on. YIN ENERGY denotes depth, peace, darkness relating itself with the moon, the night, the water, the femenine side, the color black or blue, a soft voice, calm movements, the earth, the sleep, the soul, autumn, etc. 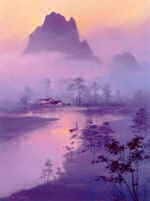 Some symptoms of an activity that is in excessive yin can be a lack of mobility, depression, sadness, an unhealthy taste for the darkness, to consume cold food, using grey and dull colors, to talk softly, to frecuent night life, etc. The solutions refering to space could be increasing the light in certain areas of the housing, avoid creating obstacles in the furniture distribuition, remove stagnant objects and storage rooms, look for bright and joyful colors, ventilate adequatly the space, do not abuse of autumnal paintings and objects (the symbolism influences in a subtle way), check the proximity of places as cemeteries, noisy areas, stagnant water, etc.Summarizing one would look for a more active and vital dosis of energy creating a new balance. Some symptoms of an activity that is in excessive yang could be stress,extreme nervousness, an desbalanced consumption of strong food like meat, alcohol, seafood or spicy things, leck of sleep, abuse of red and acid colors, abscene of curtains and protection in the housing, music that is too loud, excessive game of chance, bets, a rapid and reckless driving, etc. Advices for the application in space would be a smooth and not direct light, pastel shades, curtains that try to create intimacy, simple bedrooms without elements of dispersion like television or pc, calm music, a cookery with abundant fruits and vegetables, environments without noise, etc. It is about looking for postivie yin patterns that correct the balance. One of the symbols that describes best the duality and movement of the Yin and Yang energy is the wellknown symbol of Tai Chi. This symbol is divided into two parts, one of white or clear color (Yang energy) and the other of black or dark colour (Yin energy), an undulating line divides the two sections so that when the Yang part increases the Yin part decreases, and viceversa when the Yin part increases the Yang decreases. In theYin part appears a little clear circle that indicates that in the profound of the Yin energy there is Yang energy, and in the same way in the Yang part appears a little circle that contains Yin energy. Both, the Yang energy and the Yin energy are necessary and from both we can find infinite contrasts and grades. If all was totally yang or yin there wouldn't be colour in the world, neither would exist change and the abscene of differences would limitate the creativiy of the universe. To know about yang and yin is to know how to find the balance in the dual facettes of our existence. The balance in between these forces in an environment is what a feng shui practicer has to observe. Feng Shui goes further on in the application of these dual contrasts when the 5 elements o Wu Xing come into play, another form to provide the energy with essential qualities.